Painting "Pettegole" (Gossip girls) - oil on canvas, 50x50 cm, 2014. Weight 0.4 kg. Author - russian artist Viktoriya Bubnova, living in Italy since 1999. Shipment is carried out within 4-5 days after payment. 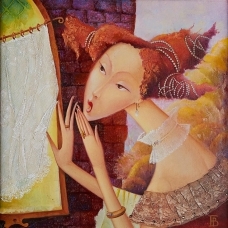 Painting "Pettegole III" (Gossip girls III) - oil on canvas, 50x50 cm, 2010. Weight 0.4 kg.&nbs..
Painting "L'Uccellatore" (Fowler) - oil on canvas, 40x50 cm, 2018. Weight 0.4 kg. ..